Among Dorothy Wilhelm's many hats (humor columnist, TV personality, speaker, etc) is the one she wears while writing books both humorous and enlightening. It's her "Author" hat, the one she had on when signing her latest releases at the Lakewood History Museum's Holiday Open House on December 5th. 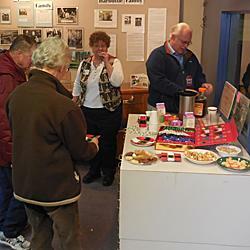 In addition to free holiday-themed refreshments, beautifully displayed antique ornaments and a self-guided tour of the museum's exhibits, many visitors to our Open House left with an autographed copy of Better Every Day, a collection of some of Dorothy's best columns written over 25 years for The News Tribune and The Olympian. In it, she shares insights on everything from loss (how she caused the Seahawks to blow the Super Bowl) to befriending wildlife (The Frog Who Came In From the Cold) to inter-generational understanding (The End of the Sandwich Generation). 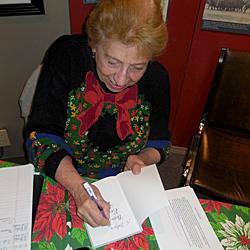 It's the second volume in her Never Too Late series; copies of the first, last year's Catch the Christmas Spirit, were available for purchase and signing. 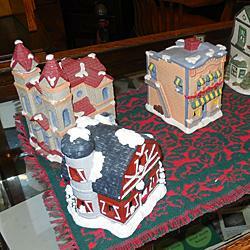 The Holiday Open House. A great kick-off to a festive season!